The effective design of high-speed, reliable switching systems is essential for moving the huge volumes of traffic and multimedia over modern communications networks. 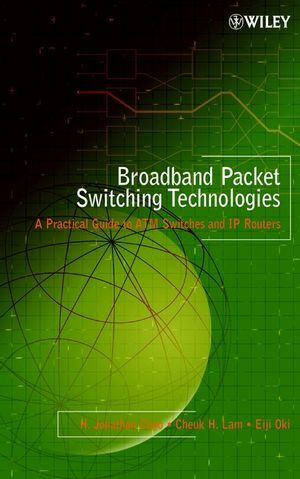 This book explains all the main packet-switching architectures, including all theoretical and practical topics relevant to the design and management of high-speed networks. Delivering the most systematic coverage available of the subject, the authors interweave fundamental concepts with real-world applications and include engineering case studies from wireless and fiber-optic communications. Market: Hardware and Software Engineers in the telecommunication industry, System Engineers, and Technicians. H. JONATHAN CHAO, PhD, earned his doctorate at The Ohio State University. Since 1992 he has been Professor of Electrical Engineering at Polytechnic University, Brooklyn, New York and conducts research in terabit ATM switches and IP routers, quality of service control, and photonic packet switching. He was co-founder and Chief Technical Officer of Coree Networks Inc., building a terabit IP/MPLS switch router. Between 1985 and 1992 he was a member of technical staff at Telcordia in New Jersey. He is a Fellow of the IEEE and has published widely in the above subjects. CHEUK H. LAM, PhD, earned his doctorate at the Chinese University of Hong Kong. He is a member of the technical staff at Lucent Technologies Inc., Landover, Maryland. EIJI OKI, PhD, earned his doctorate at Keio University, Yokohama, Japan. He is a research engineer at NTT Network Service Systems Laboratories, Tokyo. In 2000 he was a visiting scholar at Polytechnic University.